Champion Site + Sound | Rehearsal | Our largest studio, 2000 sq. ft. (50&#039; x 40&#039;) with up to 18&amp;rsquo; ceilings, is perfect for full tour rehearsals, showcases, live video &amp;amp; photos shoots. Our largest studio, 2000 sq. ft. (50' x 40') with up to 18’ ceilings, is perfect for full tour rehearsals, showcases, live video & photos shoots. 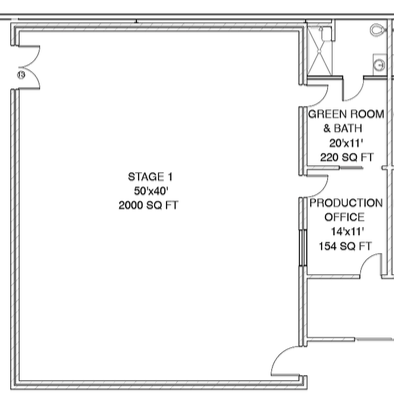 This studio also houses a private production office, green room & restroom with shower. Standard backline in the room includes two Blackstar tube guitar amps, Aguilar bass amp & a Mapex Pro Saturn Series drum kit with kick pedal, snare & high-end Zildjian cymbals. Audio gear includes the brand new JBL VTX Array system as FOH with (6) VTX 20 Tops, (4) VTX s25 Dual 15" Subs , (7) VTX F-Series Monitors, (1) VTX Single 18" Sub + a Soundcraft Vi4 48-Channel Digital Console. For availability, hourly and lockout rates + full specs including power, staging, lighting & more, please contact us.